In Part I, I wrote about using [tag]short cut[/tag] keys while using [tag]XP[/tag]. In this edition, I am going to be focusing on the “run line“. This is sometimes referred to as the “start run line“. There are many “built-in” [tag]commands[/tag] that may be run “out-of-the-box”. When these [tag]tips[/tag] and [tag]tricks[/tag] are employed, you will find yourself able to move through XP much faster and efficiently. In order to find the “run line” (RL), you will need to click on the [tag]Windows Start Button[/tag]. From there, you will notice the “Run…” command a few lines up from the start button. Click it. When you click the “Run…” line, a new dialog box will appear. This is the box where you will be typing in these [tag]shortcuts[/tag]. 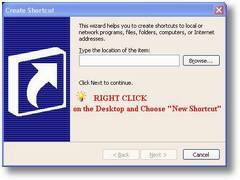 …you may enter an internet address and your default web-browser will open, and… vice-versa; You may also enter a local address, such as C:windows , within your web-browser, and it will open the local path as well. open by using the RL. 3. Now you should be able to open the application using the RL. Using the method works 99.9% of the time. 1. Open the [tag]control panel[/tag] and choose Systems Properties. 2. 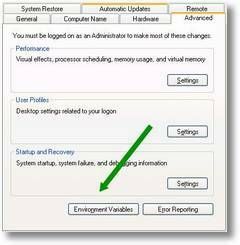 Choose the Advanced tab and click Environment Variables. 3. 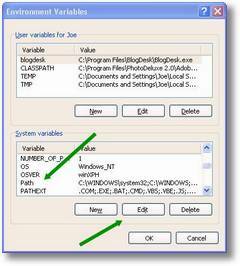 From the “Systems variables” section, highlight “Path” and click edit. Do not change anything else, or you may cause severe problems with other applications and their function! REMEMBER, YOU ARE ADDING THIS TO THE EXISTING LINE, NOT DELETING WHAT IS ALREADY THERE! 5. In the dialog boxes, click ok, then ok, then ok.
9. Now you should be able to open the application using the RL. Obviously, when you understand the above process, you may label and locate the directory anywhere you wish. By using the 2nd method you will be able to organize your shortcuts in a much cleaner fashion.